Technical Analysis and Elliott Wave Theory: and now? 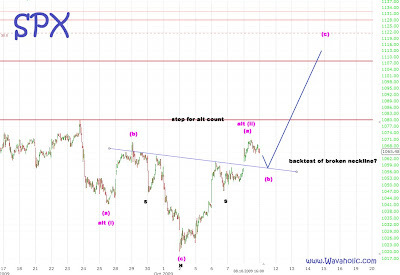 SPX: Yesterday, the SPX breached the 9/29 highs indicating that an up move to 1120 should be underway. I think wave (a) of this (a)-(b)-(c) move is finished (or just a few points away from being finished). Thus, I expect (b) to retrace possibly only 23-38% of (a), may be retesting the broken neckline of the inverse head & shoulders. After that (c) follows and should end in the low 11xx's. The alternative count you can see in the chart is the primary one from EWI. If the market moves only one tick above 1080.15 this count will be invalid (while a move below 1020 would confirm it). "Furthermore the upwaves ([i],[iii],[v]) are supposed to be zigzags, and it's quite hard to count them in that way." Have a look at Tony's count if you're interested in the exact labeling.